The Haunted Skies Project: In Defence of the UFO! In Defence of the UFO! Just a quick note (as it's late) applauding your post of 08/11/12. 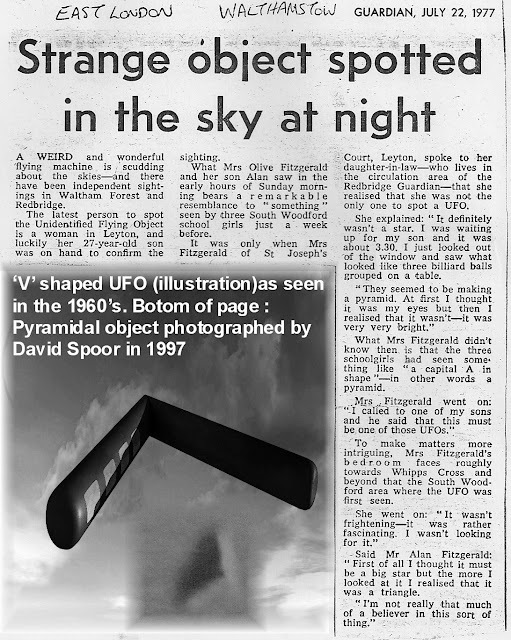 In keeping with the tone of your piece, I often feel that the real problem with ufology is ufologists, or rather their tendency to engage in exotic speculation rather than the objective analysis of the UFO phenomena. Ironically, it was when I first saw a UFO for myself around 35 years ago that I first seriously questioned the alien hypothesis. Although I haven't been able to explain the sighting to this day, nothing in what I saw (a luminous ovoid) led me in any way to believe that it was an alien artefact. Should we have stuck to UFOs (or, for that matter, UAPs) rather than "flying saucers" or "alien craft" and the like, then the subject may have attracted the resources of scientists and other similarly rationally-minded people rather than their derision and scorn. Although the subject has never been short of exotic interpretations, I've seen it degenerate from what may be termed a healthy - if often naive - search for an explanation into a quagmire of delusional fantasy and conspiracy theories where charlatans vie with each other to produce the most outlandish explanations without a shred of evidence to support a word of what they say. As an example, Stanton Friedman promotes himself as the "UFO Physicist", but his standards of "evidence" fall far short of what physics, or any other science, would accept. As a physicist, would he have accepted the discovery of a new sub-atomic particle based only on hearsay? Would he believe that controllable cold fusion had been perfected just because someone told him they'd seen it done? If that wasn't bad enough, you get cranks like Lloyd Pye touting the skull of a child who would have died (and probably lived, if you could call it that) in agony as a victim of hydro-encephalitis, which he claims is the skull of a "Starchild"! Such people would do well to remember the maxim "put up or shut up"; but then again, they can never do the former, while doing the latter would result in a drastic reduction of their income. I salute you in both recording a phenomena that is deserving of your considerable efforts while leaving the lunatic interpretations to those with less integrity than yourselves. PS: Please feel free to publish this on your 'blog. Bob Tibbitts is now available for work!